Last spring, my neighbor planted mint in our shared vegetable bed. If you’ve ever tended a garden or had experience growing mint, you know that by the next season, the only thing you will find growing in that plot of dirt (and any plot of dirt in a 30 ft. radius) are very enthusiastic/ invasive mint shoots. This has been my introduction to spring. Lots of mint. So, the crisp, green herb has been making an appearance in several recipes I’ve been experimenting with recently. In addition to being added to water for a refreshing kick and sprinkled in generous amounts on fruit salad. 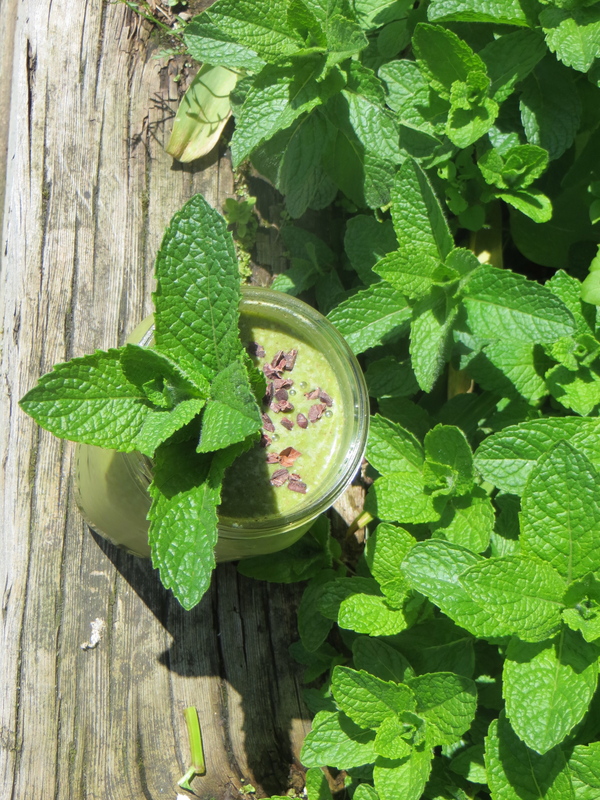 This smoothie is my play on the Thin Mint cookie. It’s packed full of green veggies, uses a good amount of those mint leaves and has the added fiber and antioxidants of raw cocoa. Injoy! Blend all ingredients in bender until smooth. Add additional water for desired consistency. Injoy! *If your kale is especially bitter, add an extra date or a small amount of honey to balance out a bit of sweetness. It should be tasty and appealing but not overly sugary. It was a dark and stormy night… the makings of so many tales of intrigue and adventure. On this particular Sunday evening, after an uncharacteristically warm and sunny Seattle summer, it struck me how black the sky had become by 7:30pm. And the heavy downpours were coupled with ferocious gusts of wind, lightening bolts that filled the sky with flashes of electricity and rolling, rumbling claps of thunder. Needless to say, no one at the Boyz Haus wanted to go on a snack run. Not even the ol’ ‘you fly I’ll buy’ deal was working its magic to persuade any of us to make a trip to the store. And so, the kitchen adventure began. Titus, Katie, Jasson and I began to scour the cupboards and freezer for anything sweet and delicious. Nothing seemed to add up. Nuts, but no apples or pears to bake. Homemade nut butter, but no dates to fill. Gluten-free flours, but no eggs to bake with. We did however, have peaches. A whole ginormous bag of frozen goodies stocked for smoothies. 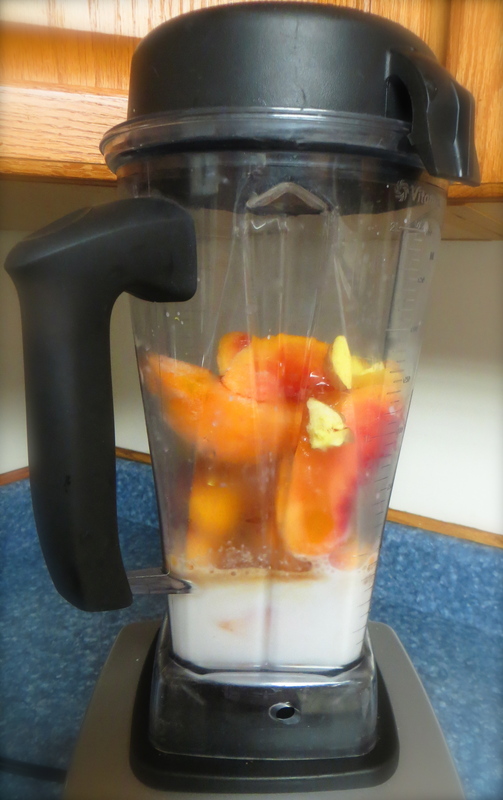 We ultimately consulted the Vitamix cookbook and settled on tweaking the recipe for peach sorbet. The whole process took literally 2 minutes and the result, out of this world! We added the ingredients to the blender, then Titus popped his head out of the fridge and suggested the last little bit of fresh ginger in the fruit drawer. About 2/3 the length of my thumb. Admittedly, I was skeptical at fist, trying to imagine the flavor combination, but that little addition really brightened up the whole dessert and gave it that wow factor. Another option is to add dried or candied ginger. I will sometimes add it to smoothies for an extra zing. Also, just about any frozen fruit will work in this recipe, and you can also use fresh fruit and add ice. Though, a word of warning, the couple of times I’ve tried it, the result is more of a sweet, berry shushy. I hope you Vitamixers out there give this one a try. Feel free to leave a comment and let me know how it goes! 2. Turn machine on and quickly increase spped to variable 10, then to High. 3. Use tamper to press ingredients into blades. 4. Process about 30-60 seconds until smooth. Do not process more than 60 seconds as motor will heat up and melt the sorbet. Enjoy! 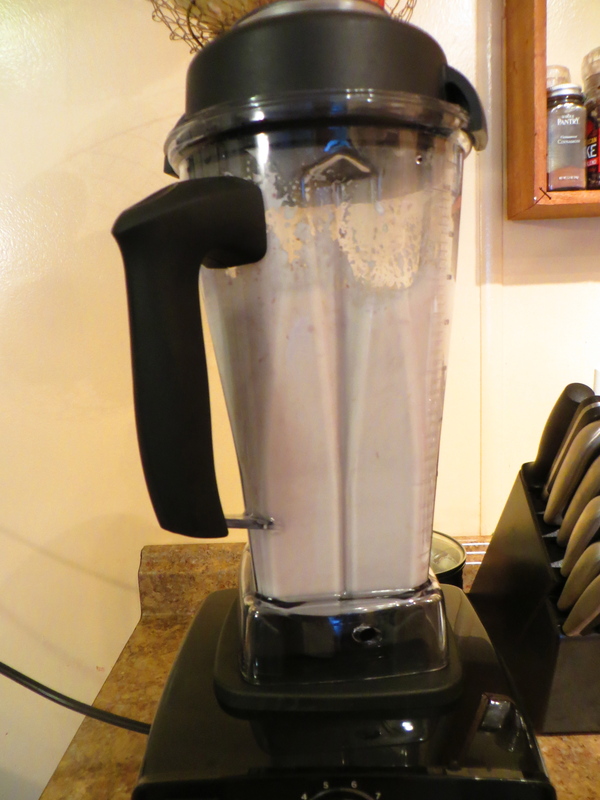 One of the most simple and satisfying things you can create in your kitchen with a high-powered blender are nut milks. It’s easy, quick, saves money and is so delicious and creamy without those pesky preservatives. One additive that is found in nearly all store bought brands of almond milk is Carrageenan, a gumming agent derived from seaweed. Unfortunately, Carrageenan, found also in organic versions, is known to cause inflammation in the digestive tract and has been linked to irritable bowel disease and colon cancer by several peer-reviewed animal studies. It is a controversial additive found in many processed foods and best to avoid it when possible. Which brings us to the simple task of making your own! One of the things I love about making almond milk (besides the base ingredients literally being almonds and water) is the flexibility of flavor and creaminess depending on what you’re using it for. The recipe below is for a moderately creamy version. I use it as a milk substitute in baking and to add to smoothies and coffee or tea. Also below find variations and flavors to add to truly make it your own. I did not filter the almonds in my recipe, which I recommend if you want it to resemble a purely liquid consistency. I like to leave more of the protein and fiber in tact, so I leave the meal incorporated. If you do not have a Vitamix or high-powered blender, you will be left with some almond bits in the bottom of the pitcher and will want to run the milk through a milk bag or cheesecloth. Simply pour it through the cloth and squeeze, and I mean SQUEEZE, the liquid into jars to store in the fridge. Use the leftover meal in baked goods (I love it as part of a crumble topping for seasonal fruit) or add it to smoothies. Also, I like to keep some pre-soaked nuts on hand so I can make milk on a whim without having to wait for them to soak overnight. It is a good idea to soak all nuts and seeds anyway, even the ones you eat in trail mix etc., and especially almonds and walnuts. The bitter tannins are released which adds to the smooth natural sweetness, and the sprouting process begins which increases the nutrient profile considerably. A certain enzyme is released which makes digestion easier for many people as well. Be sure to take nuts out of the shell before soaking and discard the leftover liquid; do not add it to recipes. Almond milk is truly and delicious and nutritious alternative to cow’s dairy. Soak, blend, pour. It’s really that simple! Give it a try and let me know what you think! Enjoy!! 1. Place almonds in a small bowl and cover with purified water. Soak at room temperature for 8-12 hours or overnight. 2. 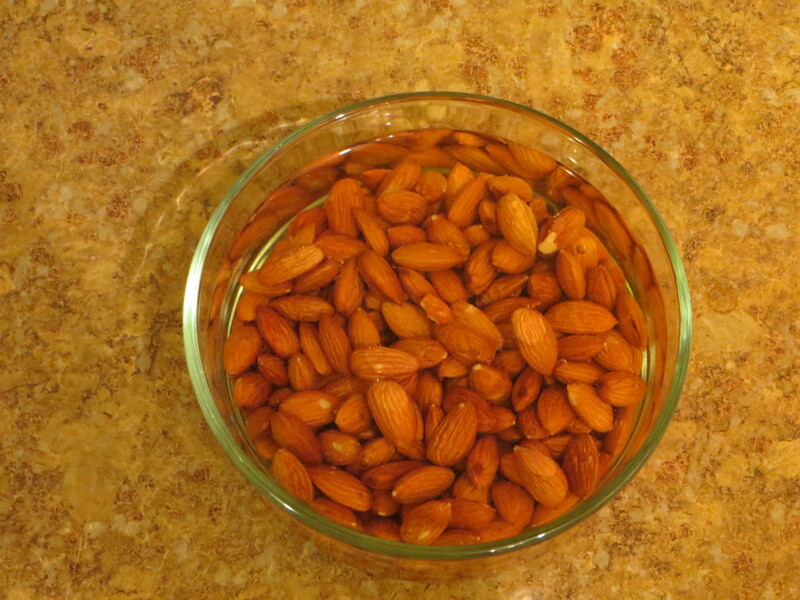 After the almonds have soaked, rinse them well and place in blender with water and salt. 3. Blend on high 2-3 minutes until you have a very smooth milk. 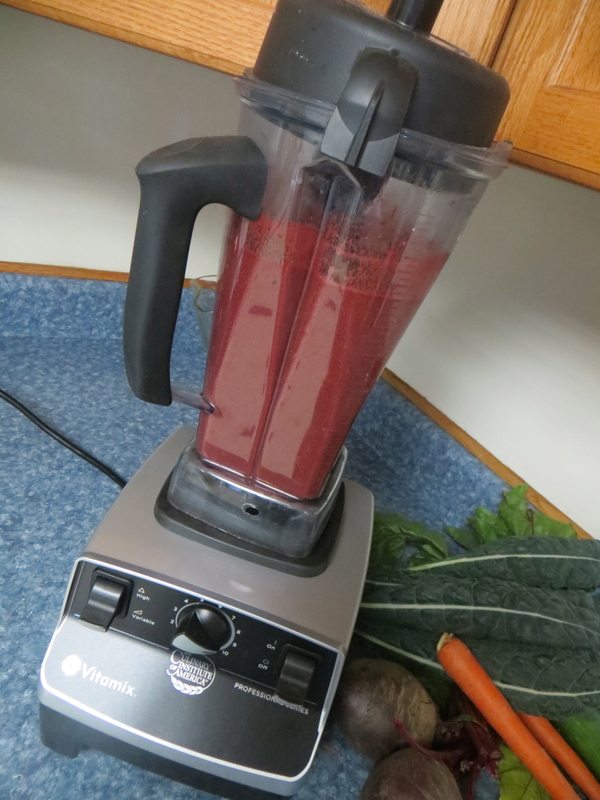 If you have a Vitamix, blend only for about 1 minute as the liquid will start to warm up. 4. 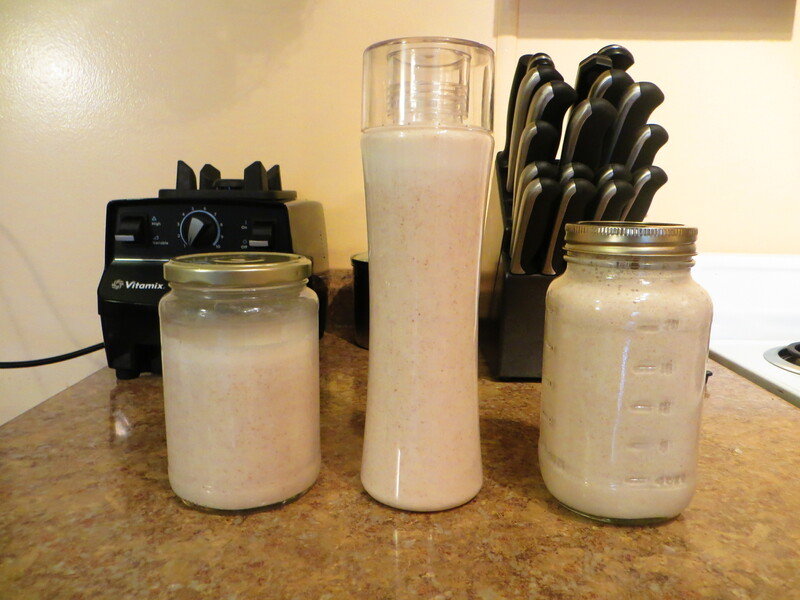 Pour liquid through a nut milk bag or cheesecloth into a container to filter. 5. Store in a covered glass jar or container for 3-4 days. Smoothies and Veggie Juice and The Vitamix, Oh My!! Today, I am on a mission to test out the new kitchen toy that is soon to revolutionize meal prep at the Boyz Haus. Behold! The Vitamix! If you’ve ever fired up one of these puppies, let’s just agree that going back to an average Oster blender after using one is simply not possible. The machine, er engine, is measured in horsepower. Enough said. It can boil water. Whaaaaaat?! 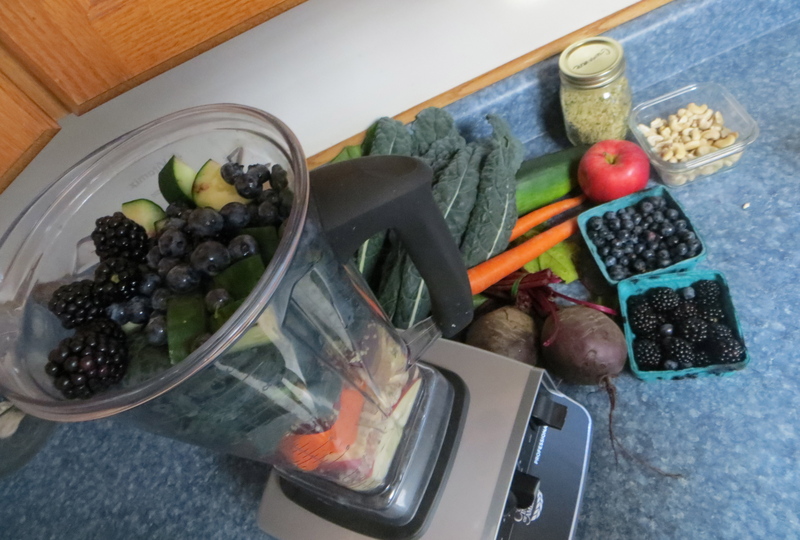 And, my favorite part, when making smoothies/ veggie juice, you include the entire vegetable, skin, seeds and all. It get’s pulverized into liquid with all of the fiber and nutrients intact. That’s what I’m talking about! …are awesome! In 30 seconds on high (no kidding), this meal in a cup is ready. It’s the perfect amount of sweetness and zing from the ginger, and I especially love the color. If you ever want to get children to eat more veggies, this is the trick, conceal the flavor a bit with an apple and make it pink. Voila! They’re sucking down kale and spinach in no time! I highly recommend incorporating fresh juice and smoothies into your diet to increase the enzymes and phytonutrients available in raw veggies. The average American doesn’t even get close to the recommended amount of vegetables required for optimal health. 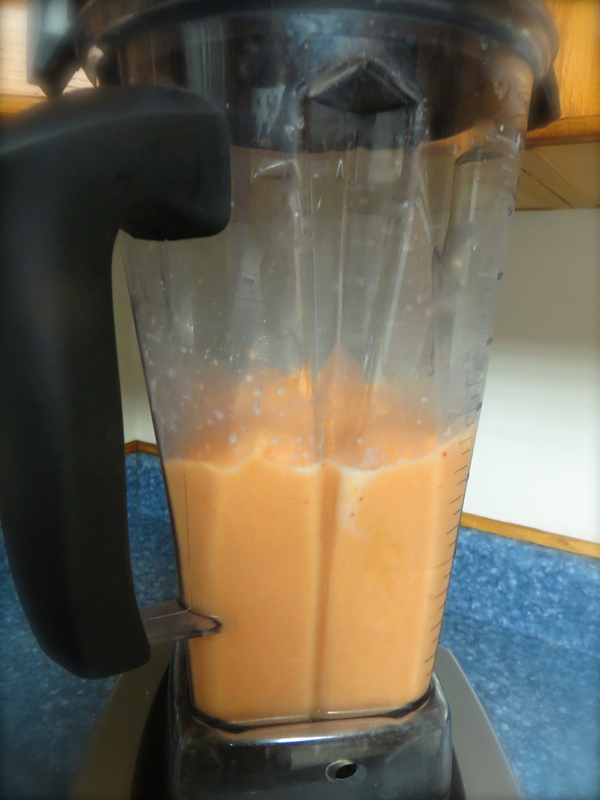 At a half cup serving size, a large smoothie can offer 6-8 servings in one yummy glass! I also suggest including raw nuts, a nut butter or a scoop of protein powder (whey, hemp or pea protein is best) to balance out the carbohydrate load with some protein and fat. You can also include a squeeze of lemon juice to lower the glycemic value and keep your blood sugar from spiking. I don’t tend to use a recipe when making things like this, but if you’re someone who likes a little guidance, Megan the Detoxinista gives some great recipes! Enjoy!